We are happy to announce that our new expedition vessel, Santa Cruz II, has just completed her maiden voyage on October 10-14, with 81 explorer guests, nine staff support members from different areas of the company, 50 crew members and eight Naturalist Guides on board. The voyage was an Eastern Islands itinerary, starting at San Cristóbal Island and ending at Baltra airport. On October 10, the two vessels were anchored next to each other one at the visitor site of Tijeretas, and this was a very unique day since this will be the day of their only "official" encounter in the Galápagos Islands. 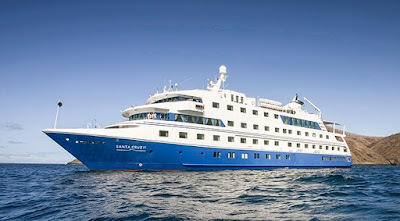 This was the day of powerful transformations, as a new era in Galápagos cruising started, and a new beginning for Metropolitan Touring as well. Since 1979, MV Santa Cruz was honoured to host world explorers, and every day for the crew offered a new beginning. Over time, the vessel not only created a name and reputation, but it fostered the understanding of high-quality service standards for Galápagos. Santa Cruz II stands right next to a colossal new chapter for all of us. It will write its own new history. As we prepared ourselves for the first day of her maiden voyage, Santa Cruz II was full of team work, with hope found everywhere, tons of excitement, and quite naturally the feeling of the unknown. Truly, transition time was a mere few hours, where crew members were waving goodbye to their floating home for so many years…some for over 20 years! For sure a very touching moment, but the excitement of our new fleet member tapered the inevitable tears…and the show must go on. In no time, our new guests arrived and suddenly the expedition took a new shape, and they liked it, and so did we. We were all treated to a glorious "sunset cocktail", where guests received a commemorative shirt, buff and cap with the inscription "Santa Cruz II Maiden Voyage Oct. 10-14, 2015". Guests knew they were part of this new history by being on board this unique voyage. History never repeats.